The Daessy Rear Folding Mount allows the device to be folded behind the wheelchair when not in use. We now supply all Rear Folding Mounts with a Daessy locking mechanism for added security. 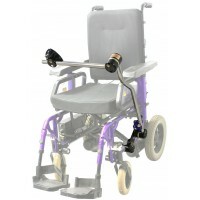 DLRFM: The Locking Rear Folding Mount allows a device to be moved behind the backrest of the whee..
OSS: Supports a Standard Series Daessy Mount on the opposite side of the wheelchair to alleviate ..